Should China build mega-cities or a network of linked middle-sized metropolises? Can Europe's mid-sized cities compete with global agglomeration by forging stronger inter-urban links? This paper examines these questions within a model of recombinant growth and endogenous local amenities. 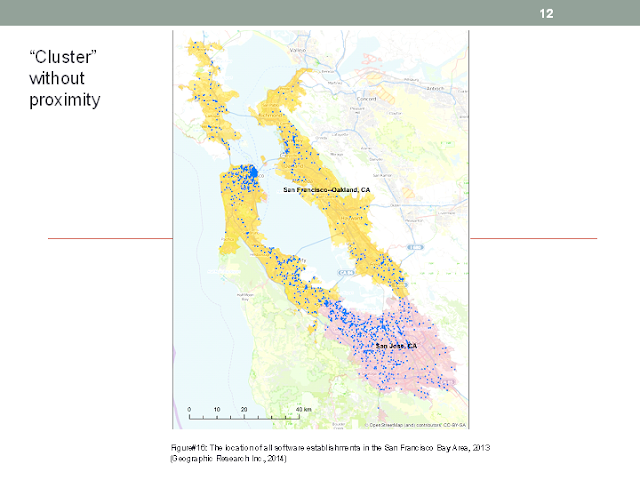 Three primary factors determine the trade-o⁄ between networks and big cities: local returns to scale in innovation, the elasticity of housing supply, and the importance of local amenities. Even if there are global increasing returns, the returns to local scale in innovation may be decreasing, and that makes networks more appealing than mega-cities. Inelastic housing supply makes it harder to supply more space in dense confines, which perhaps explains why networks are more popular in regulated Europe than in the American Sunbelt. Larger cities can dominate networks because of amenities, as long as the benefits of scale overwhelm the downsides of density. In our framework, the skilled are more likely to prefer mega-cities than the less skilled, and the long-run benefits of either mega-cities or networks may be quite different from the short-run benefits. Here are some thoughts: 1. There are supply chains for things and supply chains for ideas; 2. Large portions of many chains choose locations in urbanized areas; 3. The "what to make vs what to buy" choice involves where to buy what; 4. Everyone participates in many supply chains (as buyer and/or as seller) and chooses a location that works best in light of these various roles. 5. The policy choices (Glaeser et al ask [paraphrasing] "what should Europe or China build"?) are misleading; supply chains are too complex to be planned top-down; flexible land markets are the reasonable policy choice. 6. Which are clusters, cities, networks, agglomerations? 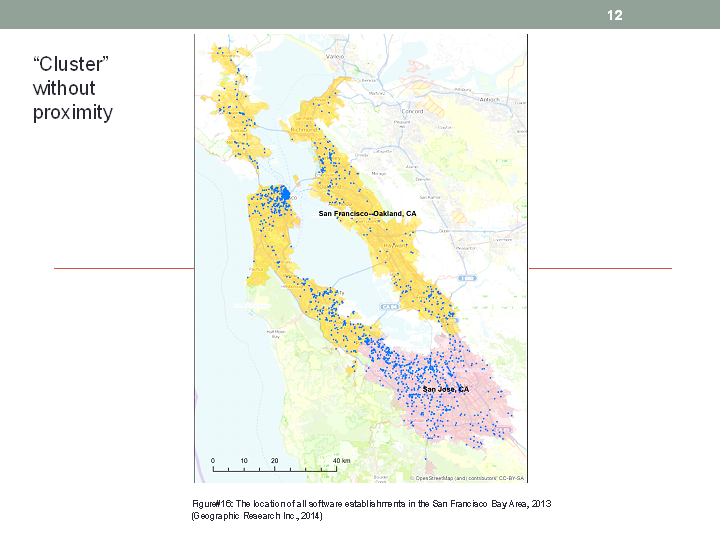 Below is an example of how software firms are located in the Greater San Francisco Bay area. Many densities are apparent. Glaeser et al (and many others) give the impression that it is a matter of density-on or density-off. The people whose jobs are dots on the map below are surely networked electronically but many are also available for occasional face-time. The interaction blend and trade-offs involved (along with many others) influenced their choice of locations. It is unclear that any policy besides one that encourages regulatory flexibility would do any good.